What is the best ferret food? Unlike many other alternatives on the market today, this one comes with as much as 60% protein and 16% fat, which means that it is safe to use for your pet and nutritious enough to provide him or her with the necessary energy. The rest of the ingredients consist of added pro- and prebiotics, enzymes, phytonutrients, and a variety of other essential things that the animal will require for healthy development. A healthy diet for a ferret should contain no starch, and it is a great thing that this product comes completely free of such fillers. You should also know that the high percentage of protein - 60% - makes it ideal for ferrets and their natural development. One thing you may notice once you start feeding your ferret this product is that body odors become less offensive, as well as the smell of his or her stool. 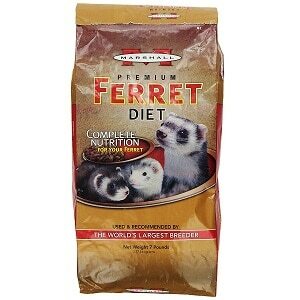 Some caution in introducing your ferret to this diet is recommended, due to its rich protein content. A perfectly balanced ferret foot that provides your pet with everything he or she needs. In the wild, ferrets eat a lot of meat, and that is why any food you might get for such a pet in captivity should be rich in protein and fat. This particular product is rich in the nutrients necessary for the healthy development of your pet, and that is why it has so many positive reviews from ferret owners. Your ferret’s coat will become thicker and shinier. The formula is enriched with other nutrients, like probiotics. Be aware that some vegetable bits are included in the formula, so you should still feed raw meat to your pet. A complete formula for ferrets that offers excellent nutrients for a long healthy life for your pet. 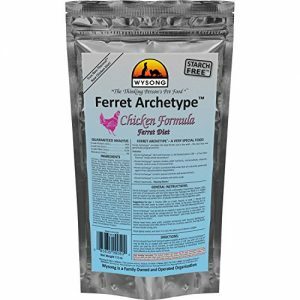 If you are looking for a type of ferret food that can ensure the proper diet for all life stages, look no further than this product. Rich in nutrients such as omega fatty acids, this product will work wonders for your pet’s dry skin, and it will also provide the ferret’s body with the necessary means to delay aging. As it is based on meat, it will surely be your ferret’s favorite, and you won’t have to worry about a picky eater pushing it away. Some buyers report that the smell of the ferrets’ waste tends to become quite overpowering when on this diet. 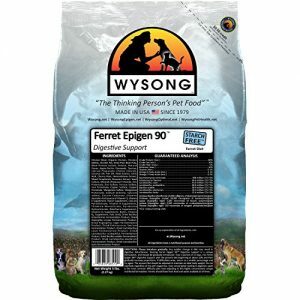 An excellent meat-based ferret food product that is packed with omega fatty acids. We know it will be worth your money and effort to give the following products a try. They cater to the need for nutrition, taste, and value and that your pet is sure to love as well as you, the owner. We guarantee that you won’t regret giving these a try. 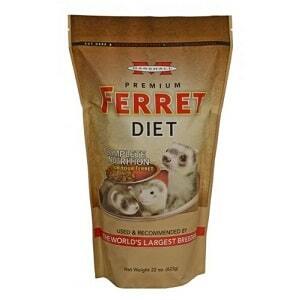 This diet is made to provide the digestive support that your ferret needs. The neat thing about it, unlike so many other options out there, is that it does not contain any starch. This particular detail makes it especially safe for ferrets, who are primarily supposed to eat meat and nothing else. The Epigen 90 comes with 60% protein and 16% fat, which means that it will provide the right nutrients for your pet. The amount of fat is absolutely necessary if you want to make sure that the nervous system of the ferret develops in a healthy manner. On top of everything, this product is enriched with a variety of valuable ingredients that range from pro- and prebiotics and enzymes to natural antioxidants, minerals, and vitamins. It even contains nutraceuticals and phytonutrients. One note that we have to make is that this formula is a bit richer than the original one, and some ferrets might have loose stools upon you introducing it into their diets. One of the core advantages you should bear in mind if you’re trying to decide whether you should opt for this product is that it contains no starch whatsoever. 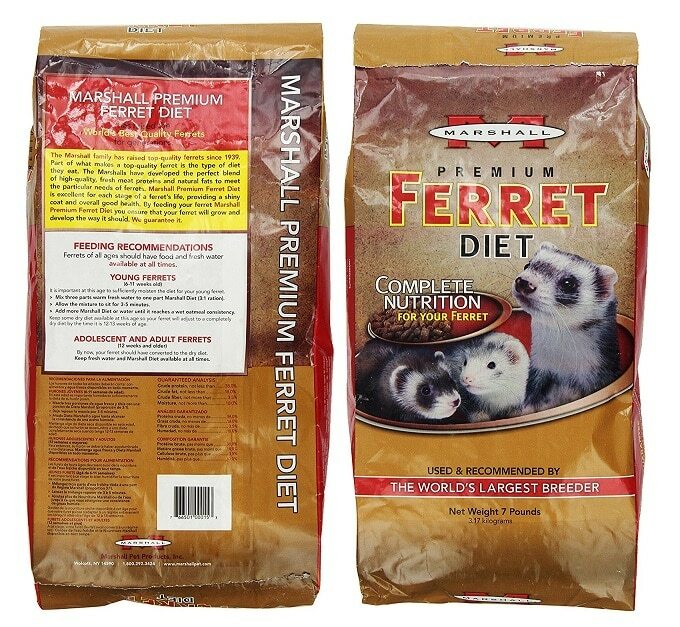 Its 60% protein and 16% fat content makes it possible for the ferret to benefit from healthy development. There have been reports from ferret owners who claim that, upon changing their pet’s diets to this one, the stool smelled a lot less and their ferret’s general body scent was clean. This formula is enriched with a broad array of essential nutrients like natural antioxidants, minerals, and vitamins, but also pre- and probiotics. Because this formula is slightly richer compared to the original one, you might have to introduce it in the diet of your pet in a progressive manner. Otherwise, you may notice that the ferret experiences loose stools for several days. Ferrets are known to be carnivorous, so if possible, avoid feeding them any type of food that might contain starch. This meat-based alternative might make a good choice if you are in the market for a new variety, and you want to spice things up once in a while so that you don’t just feed your pet raw meat. The product contains a good deal of protein, and it has been enriched with plant nutrients, pre- and probiotics, as well as minerals and vitamins. All of these along with the many micronutrients and nutraceuticals that can be found in the formula work together to provide the core essentials that your ferret needs for happy and healthy development. 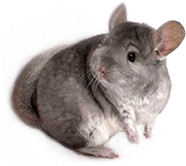 Both the protein and the fat content of this alternative will supply the energy that the pet needs on a day-to-day basis. The fat will keep your ferret as sharp as a tack for as long as possible. Since this is a meat-based alternative, it will provide the nutrients that your ferret needs. It also contains a good deal of fat for a perfect development of your pet’s nervous system. Some pet owners report that, upon introducing this formula into the diet of the animal, they have noticed that the ferret’s coat is shinier and thicker. As with some of its competitors, this product has been enriched with vitamins, minerals, as well as probiotics and prebiotics. Its crumbly and slightly moist consistency renders it irresistible. Your ferret will love the taste and the feel of this food on his or her tongue. 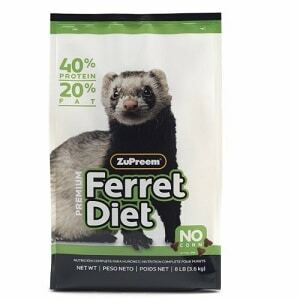 Unfortunately, as is the case with many other bagged ferret foods, this one does contain several vegetable ingredients coming from blueberry, barley grass, broccoli sprouts, plums, as well as carrots. The percentage of these ingredients is not high, however, so if you mainly feed your ferret a raw meat diet and occasionally supplement it with this food, the animal will be perfectly healthy. Formulated to answer the need for complete nutrition for your playful pet, the product delivers the nutrients that your ferret needs in just the right amounts to suit every life stage. Because it is already complete in its form, the Marshall Premium FD-015 does not need to be mixed with other pet foods just to ensure a balanced nutrition level to keep your pet as active as it ought to be. This choice is rich in Omega 3 and 6 acids, which reduce inflammation and have a favorable effect on dry dry skin, all the while helping boost the immune system when your pet becomes a senior. This option is suitable for the strictly carnivorous diet that ferrets have and also answers their need for meat-based protein. It blends together the freshest meat ingredients manufactured under a proprietary low-temperature process to ensure the preservation of the necessary nutrients. Your ferret will surely ask for more of this food every time! This product undergoes an exclusive low-temperature process to extract high levels of nutrients from the freshest meat ingredients. It is nutritionally suitable for the carnivorous diet of a ferret, as it comes with meat-based ingredients. Your furry pet is sure to grow strong and healthy with proper care plus the Omega 3 and 6 Fatty Acids in this food. Because of the meat-based ingredients, this option helps build your pet’s muscles while being easy to digest. Aside from high-quality, fresh meat proteins, this food also comes with natural fats to keep the animal’s coat shiny and maintain overall good health. A customer who suffers from arthritis says the large bag is awkward to tape closed and has a huge size that can be difficult to move. Because a ferret has a unique digestive system that passes food quickly, this product contains easily digestible nutrients for premium absorption. Fed by top breeders and recommended by vets all over the world, the ZuPreem Premium 69480 needs no supplements to supply your furry pet with the nutrients it needs for optimum digestion and absorption. Providing 100 percent complete and balanced nutrition, this product is formulated with 40 percent protein and 20 percent fat to address the complete nutritional needs of the animal. It also comes with fresh, not frozen chicken, plus real egg for superb levels of protein. There are no extenders and fillers such as fishmeal and corn, which can cause allergic or digestive reactions. This product is fortified with essential vitamins and minerals so it is complete as it is. To stay true to the natural formulation, this choice uses no chemical preservatives either. You’ll love how the manufacturer of this ferret food ensures an all-natural formulation by using no artificial preservatives in making the product. Your pet receives 100 percent complete and balanced nutrition from this option made with 20 percent fat and 40 percent protein. Because this choice is complete in itself, there’s no need to use supplements at feeding time. 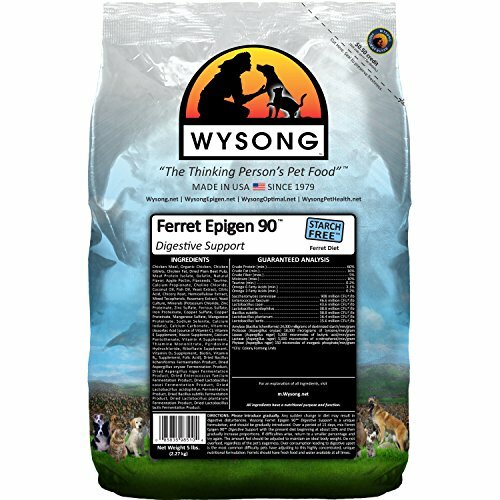 Formulated to be highly digestible, this food caters to the unique nutritional needs of ferrets whose digestive tract passes food quickly in as little as 3 to 4 hours. You can rest assured that this product has no fillers or extenders such as corn and fishmeal that might only cause digestive and health problems. Some users have observed that although this food is good for their ferrets, the poo and pee of their pets seemed to be a bit more stinky than the usual. High in fresh meat-based protein, the Marshall Premium FD-017 caters to the strict carnivore diet of your ferret. It is formulated with the highest quality ingredients and undergoes a proprietary cooking process to ensure your furry pet gets all the necessary nutrients from premium processed food so fewer essential elements are lost. The slow process of low heat cooking enables your pet to easily digest the necessary fat, carbohydrates, and proteins, considering how quickly the digestive tract of the animal passes food out. Your pet can absorb the nutrients quickly for optimal use in its bodily functions. Ideal for ferrets of all stages and ages, this option is also suitable for teething ferrets as it can be mixed with water to get a paste-like consistency. It is made in the USA, so you are assured of high quality and good nutrition that your furry pal will enjoy at every mealtime. 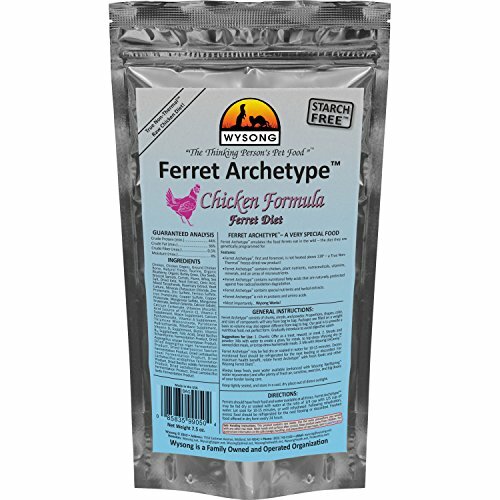 Formulated under slow processing, this dry ferret food is cooked at low heat to ensure the preservation of nutrients so they can be easily absorbed through the animal’s unique digestive tract. High in meat-based protein, this food caters to the strictly carnivorous diet of a healthy and normal ferret. What you will appreciate is how this product comes with no added flavoring and colors so your pet gets only natural nourishment and nothing less. Suitable for ferrets of all ages, this product can even be mixed with water to make a paste that can support the digestion needs of teething pets. Made in the USA, this dry ferret food assures you of premium formulation and quality control like all other USA-manufactured products on the market. According to one satisfied customer, this product tends to pick up moisture in a damp environment so it should be stored with care. With the growing popularity of ferrets as household pets, the food industry has yet another segment added to it: ferret food for sale. While no single ferret food can really claim to be the best choice on the market, there are some that come really close. These are what those choices come with. Ferrets subsist on a strictly carnivorous diet. When kept as pets, they also thrive on meat-based pet food. A ferret is neither a rodent or a dog so what those other animals eat are not suitable for the furry creature. You can’t feed a ferret vegetable mixes or seeds either. The best food for a ferret in the wild would be small rodents, which they eat as an entire organism, bones and all. Ferrets would consume everything including the organs and fur, and everything they can swallow or chew. This makes the animal a good defense against small rodents on farms. Meat is the main source of nutrition for a ferret. That said, a pet ferret can’t be fed live prey, can it? Go for processed pet food that is meat-based and high in fat and high protein. Ferrets need little to no carbohydrates, so extenders and fillers such as corn or even fishmeal are not necessary. Fiber is also not suitable because excessive vegetables and fruit can be sources of digestive issues. If you look at the variety of products featured as the best dry food for ferrets, you will find that they are marketed as easily to digest. Ferrets have a unique digestive system that passes out what the creature eats within only 3 to 4 hours. This means that, without proper processing during the manufacturing process, precious nutrients could be lost that quickly by the creature. Slow-cooked commercial food processed in low heat ensures that the nutrients are intact. The process still ensures those essential elements are easily available once broken down in the system of the animal. This will ensure good nutrient absorption for the optimal growth and development of your furry friend. Too much processing can cause issues, as well. Your pet could develop dental diseases, gastrointestinal conditions, bladder stones, some types of cancer, and skin disease. Despite the dagger-like teeth of ferrets, large and hard foods such as biscuits can lead to the easy development of dental disease. Feeding human snacks to your ferret is not wise since plenty of human foods are indigestible and toxic to the animal. Onions, tea, coffee, sodas, tobacco products, caffeine, milk, and ice cream should be avoided. That said, your pet needs variety, though. You can have your pet do amusing tricks including begging, walking to heel, and rolling over by offering treats, which can also be effective for rewarding good behavior. Many specially formulated, safe ferret treats are on the market and can be found by reading the best ferret food reviews. 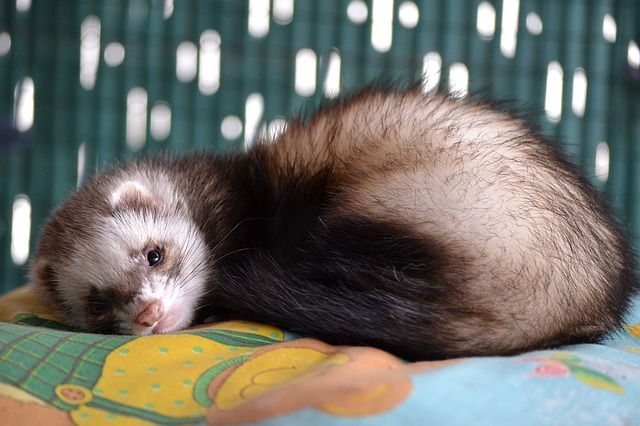 Some notable nutrients in ferret food are Omega 3 and 6 fatty acids, which aid in the proper growth and development of a healthy and frisky pet.